The term “teeth in a day” is an increasingly popular phrase that is not always well defined or understood. In summary, in specific patients under various circumstances teeth can be removed, implants placed and temporary tooth or teeth placed all at the same time. This applies to either a single tooth or a full mouth. When all of the teeth are involved it is commonly called an “all on four” restoration. Although having teeth replaced in one day is very appealing , it is important to remember that only under select circumstances are patients candidates for this type of therapy. Prior to the determination of the appropriate treatment, a comprehensive evaluation is required in order to determine the individual patient’s specific circumstances. Included in that exam are the medical status, the overall dental health of the patient, the presence of any type of gum disease which can adversely affect healing (ie. Smoking habits). 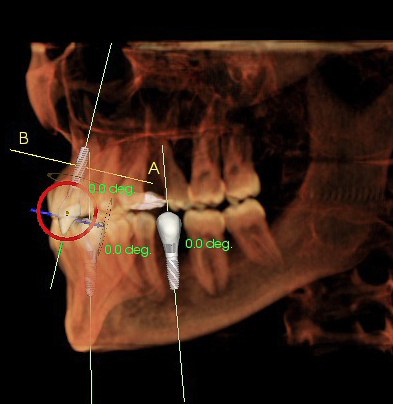 The amount of bone is determined using advanced imaging with Cone Beam Cat Scans (CBCT) and other advanced diagnostics performed in the office. The cone beam image is taken right in our office. Within minutes, we have a detailed 3-Dimensional image of the entire jaw. Using specialized software, we can simulate different procedures before actually working on the patient. Regardless of the approach used, the final restoration (a single tooth or an entire mouth) is never immediately placed under any circumstance. An ample amount of time ranging from 4 to 6 months is always required in order to insure that the implants have successfully fused to the bone (integrated) before the final restoration is placed. To determine if you are a candidate for this approach and what the most appropriate course of treatment would be for your individual situation, please call our office for a comprehensive exam. Regardless of the final treatment it is imperative that all patients receive a comprehensive evaluation and a review of alternative treatments, so that a safe and predictable approach can be individually recommended.